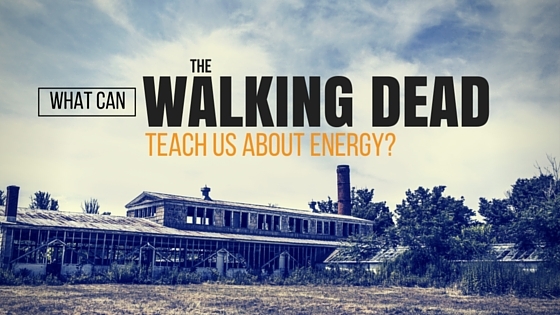 What Can The Walking Dead Teach Us About Energy? There’s a lot to like about autumn. Trees are erupting with gold and orange leaves, temperatures (and energy bills) are down; there's football to watch, food-based holidays and the return of your favorite TV shows like AMC’s The Walking Dead, back for a sixth season October 11th. The group’s adventures take place in a fictionalized city of Atlanta. But, there are some real-world lessons that can help explain our relationship with energy and as users-or producers!-of power. With all nationwide infrastructure (aka the grid) inoperable, how is electricity still being used? Answer: Distributed Generation (DG) or the generation/supply of electricity nearby (or at the exact location) where it’s used. Many people don’t realize that they are already familiar with Distributed Generation and its various systems. DG uses alternative systems to produce electricity instead of the usual method: burning fossil fuels. Wind, Solar, Hydropower and Generators are all DG systems. With the announcement of the Clean Power Plan, the discussion of and drive for actionable steps to improve our current grid have come into the spotlight. For instance, the Department of Energy recently made a 1 billion dollar commitment to projects focused on Distributed Energy Resources (DERs). If you’re interested in technology, current events, politics or all of the above, you’ll benefit from having at least a basic understanding of DG. Devices that use diesel or natural-gas to generate power; available for residential homes. Every season of TWD has shown the use of a generator: Herschel’s farm, the prison and Woodbury all use at least this type of DG. Most memorably for many fans is the CDC’s back-up generator in season one—the one programmed to trigger the building’s self-destruction when it failed. Luckily, we don’t have to worry about a scarce fuel supply (or Walkers!) and many people have generators at home in case of emergency. Panels, rooftop or other, generate power from the Sun. In season 3, we’re introduced to Woodbury—the town that seems to have it all, including a reliable electricity supply. Viewers later learn how this is possible: Solar Panels stationed around town and generators. Essentially, this combo creates a micro-grid, a mini-version of our current electricity grid, which supplies the residents. While or rooftop solar is already becoming somewhat commonplace, community solar is in the first stages of wide-spread use. Community solar makes it possible for the 50% of consumers who live in apartments or otherwise are unable to implement rooftop solar to access and benefit from this energy source. These systems let you store any surplus energy you’ve produced for later use. Elsewhere in TWD, Rick and the prison group have hooked-up their cell blocks with an impressive power system. Their make-shift power plant, seen here in a behind the scenes tour of the set, uses batteries connected to a large generator to produce and store their power. Storing your energy at home with a battery has only recently become possible, but already companies are following in Tesla’s footsteps to make this technology available and affordable. Batteries store energy generated from solar panels or other sources and work with the existing grid services instead of replacing them. A smart grid creates a reliable platform that promotes the integration of renewables and storage tech with established distribution processes. Turbines or micro-turbines that convert wind into energy. At Hershel’s farm, we occasionally get a glimpse of some windmills. Like solar, wind energy can be used on its own or in combination with other DG sources. Since going to the gas station for more fuel isn’t exactly convenient for the characters, it’s likely that those windmills are put to work. Wind power is another solid option for renewable energy and is starting to gain popularity, though more slowly than solar. At current rate of growth, wind could potentially account for 12 % of U.S. power demand by 2030. Zombie apocalypse or not, Distributed Generation can benefit system owners personally—stability, savings and increased property values—and on a broader-scale, considering the positive environmental impact of using DG systems. Smart grid upgrades continue to make it easier for you to adopt these practices. As usage grows, so do the opportunities to become a smart power consumer.